I'm mutating into a bug. How are you? I am making icons again and enjoying the creativity! Here are some new Stargate Atlantis ones. Say hi - it is the nice thing to do. Credit would be nice, it is appreciated. I have a bunch of icons I haven't posted so I am starting the cleanup. Another post or two to come. Just popping in to say thanks to all my lovely LJ friends. Thanks for all the birthday wishes a couple of weeks ago. It really meant a lot to me. I'm not around LJ so much anymore. I have made some lifestyle changes and that means spending much less time on the computer. That also means I am not making icons. But the changes have made me feel better and I do miss all of you. I am popping in and keeping up with you as much as I am able. Love to all. I haven't been around much lately but am trying to keep up with your posts! 1. I was on vacation in Florida with my Dad and my Sweetie. Had a marvelous time. A highlight was watching the sunset every night over the ocean from the balcony of the condo my Dad rents. Photos later, when I solve #2. 2. When I got home, my desktop wouldn't turn on. Sweetie will look into that next week. 3. Won a contest over at spn_bigpretzel. As a prize, I was asked to choose a charity for a $25 donation. I chose the Cancer Society because my Mom died of cancer earlier this year. 4. Thanks to trystings and diek09 for the Halloween cookies. They are delicious as are you! 5. No icons until my desktop gets fixed. Just can't do artwork properly on the laptop or iPad. Anyone waiting for my entries will have to wait or go on without them. No idea when the desktop will be back in business. Love to all. Thanks for giving me a peek into your lives. Will try to keep up better. 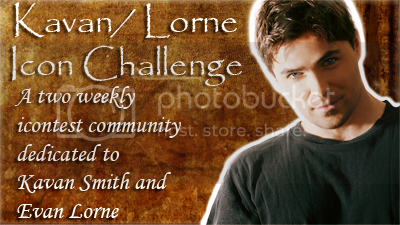 I don't make many headers and normally only for myself. But, I downloaded Topaz filters (30 day free trial - so why not?) and have been playing around with them to see what I could come up with. I made the new header on my journal and liked it so decided to play some more. Headers follow. @theguardhaven held an art contest on Twitter. The challenge was to make some art using the tattoo symbol from the show (Haven). I'm always up for a challenge so entered. And I was one of the prize winners! I'm going to get a shirt I think since they asked me my size. The icon is a version of my artwork. PS - if you have a second, please vote at fringe_epic. Awesome icons but never enough votes! We went to the Toronto FanExpo today. It is the largest Sci Fi/Comic/Anime/Horror etc. convention in Canada. I had heard it was crowded, but had no idea. The Doctor, the Centurion and the Kissogram girl. 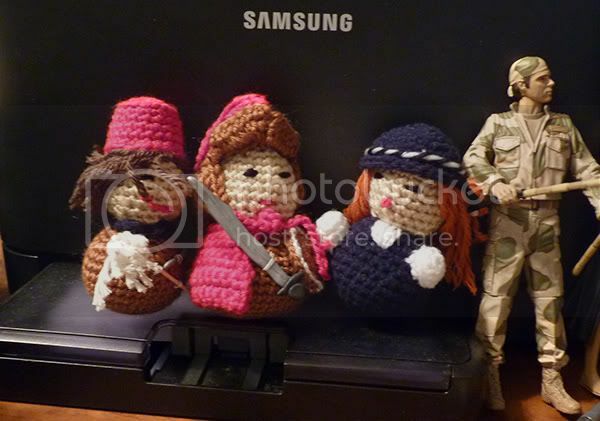 Oh - and Daniel Jackson with bandanna for size comparison. Stargate Atlantis Icons - Nothing on TV, Bring it Back! I don't talk much about personal stuff on LJ. I'm just a pretty private person who doesn't waste energy with negative comments on social media. But I feel that I have a lot of friends here and people who count on me to participate. I have been going through a lot of sorrow the last few months. So, if I am not making icons or entering contests or posting or answering your posts it is just because I have no energy to do it. I'll be back to normal soon so don't worry. Thanks for understanding. SGA Icons - Gate Time! 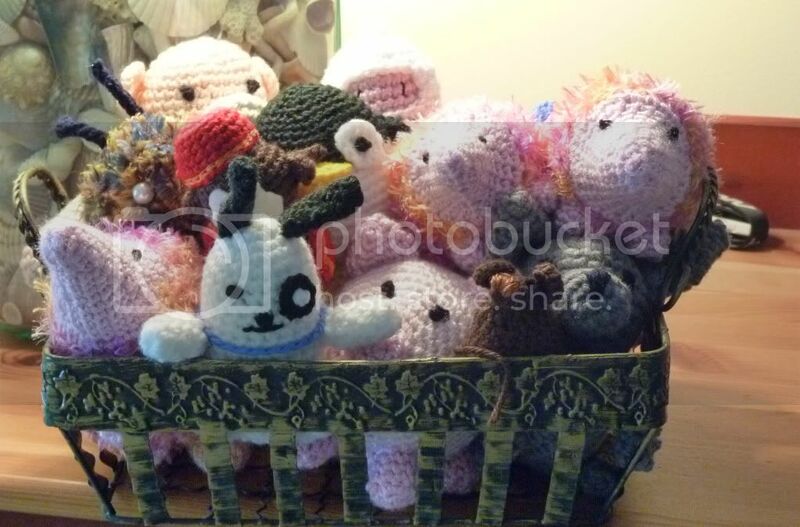 I've been quite busy making amigurumi and giving them away. Here's a recent batch. If you have a second torchwhostills could use some votes here ! Thanks so much to everyone (and I mean everyone) who wished me a happy birthday yesterday. And love and hugs for the lovely gifts from wickedvengeance, fififolle, supplyship, brihana25, jenniferjensen and taj_mahal07. It really does mean something to me and made my day!!! We really need some more participants in kavlorne_itest! We are in danger of folding and he is so, so pretty. 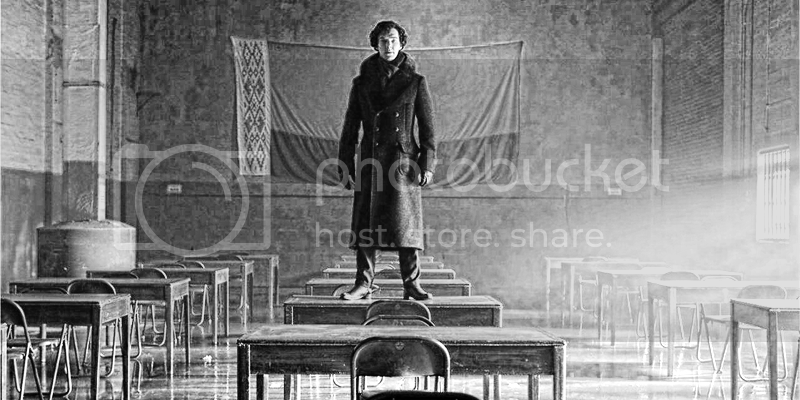 And - please vote over at sherlockstills.